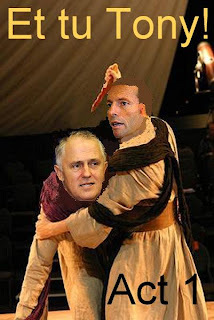 Waynes Word on Web: Et tu Tony! The opposition to stable government begins it's destructive behaviour with an act of betrayal. "Down with your illegitimate rule." Saint Kevin, the old dragon slayer, is ever so nicely stabbed in the back by our heroine. She goes on to be loved by nearly fifty percent of all the people in the land. "Sorry" she said as Brutus Tonias, the usurper in waiting, lurks maliciously in the background. Saint Kevin and Malus Turnbullius return as Ghost Ministers for the final battle. Love the image manipulation and the sentiments! Strangely, or maybe not, Kev seems happy on the world stage minus the responsibility of kicking the blue heelers away from his ankles while he works! and leave a comment there. No activity there means it disappears mighty quick!